Whether it’s your wired network at your business or a stereo system in a vehicle, low voltage wiring is likely something that rarely crosses your mind, if ever. For most people, it’s an unseen part of the backend operation for your equipment so there’s usually no reason to think about it, unless something goes wrong. In cases when something does go wrong or you’re in the market to build or remodel, this unfamiliar idea suddenly becomes topical. With sound systems and other AV equipment, selecting materials is relatively straightforward as quality of analog components relates to the gauge of the wire, insulation, and conductivity of the endpoints. With digital connections (e.g. HDMI, fiber optic audio cables, etc. ), you should be pleased to know there’s virtually no difference between expensive cables and bargain bin connectors – aside from durability, digital connectors either work or they don’t. However, it’s a different story with networking cables. This is because not all Ethernet cables are not created equally. 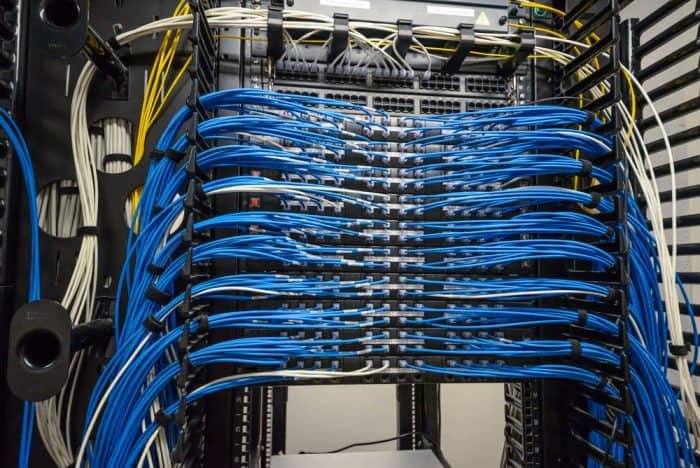 It’s probable you’ll use a combination of different types of cables at your business, between AV equipment and connecting your networked devices. Below, we’ll look key differences between today’s most popular cables and explain scenarios where you should consider investing a little for better cables. For starters, the insulation in most kinds of cable comes in all different colors. Like other wiring, this has virtually nothing to do with the capabilities of each wire. However, it does come in handy when color coding different connections on your patch panels and switches. Aside from proper labeling, this is a great way to easily see different connections to pertinent systems – for example, many use a certain color to connect to edge devices, a different color for non-fiber storage connections, a certain scheme for monitoring ports, and so on. The real differences boil down to the type of Ethernet wire used in low voltage cabling for your business network. This will be important when discussing a project with a wiring contractor or tackling a wiring project yourself. Cat5 – This is perhaps the most well-known cable as it’s been the standard for quite some time. Ideally this kind of cable should be avoided as it only supports speeds between 10 Mbps to 100 Mbps over short distances. However, for devices that don’t require a lot of bandwidth and are close to a switch, this is a viable option. Cat5e – This improved variation of the Cat5 cable can support speeds of up to 1 Gbps and be run over longer distances, supporting 100 Mbps connections up to 100 feet. This kind of network cable has added insulation which maintains integrity over longer distances and also reduces interference between the signals passing back and forth between the cable. Generally speaking, this is still today’s most common choice for a majority of networking needs. Cat6 – For slightly more money per foot compared Cat5e from most suppliers, Cat6 is faster, supporting speeds of up to 10 Gbps over short distances. This should be the lowest quality cable utilized when connecting high-speed ports on your main systems or as the main connection to your service provider. The bandwidth here more than doubles any Cat5 variation at 250 MHz, but only maintains highest speeds up to roughly 100 feet. Cat6a and Cat6e – These are very close to close to regular Cat6 but the bandwidth is rated at 500 MHz and is better shielded. These cables can maintain 1 Gbps speeds just beyond 300 feet and 10 Gbps at up to 100 feet, making this a better option for connecting high-speed devices over long distances. Cat7 – Like CAT6, the speeds are about the same however, these can achieve 10 Gbps over longer distances of up to 150 feet and can hit the 100 Gbps speeds at 15 feet or less. These cables also require special connectors known as GG45 to support these speeds as regular RJ45 connections used by other cables negate this wire style’s capabilities. Ideally, Cat7 should be reserved for connecting incredibly devices that transmit substantial amounts of data. Otherwise, you won’t see much advantage, considering the price. If you’re looking for a low voltage wiring contractor or have some questions, feel free to get in touch. Call us at 1 (770) 936-8020 or send us an email at info@widedata.com and we can help you through figuring out your low voltage wiring needs.